A monk at Wat That Thong temple in Bangkok During a Buddhist merit-making ceremony to pray for the tens of thousands of elephants poached annually. 9 March 2013. Bangkok, Thailand ? 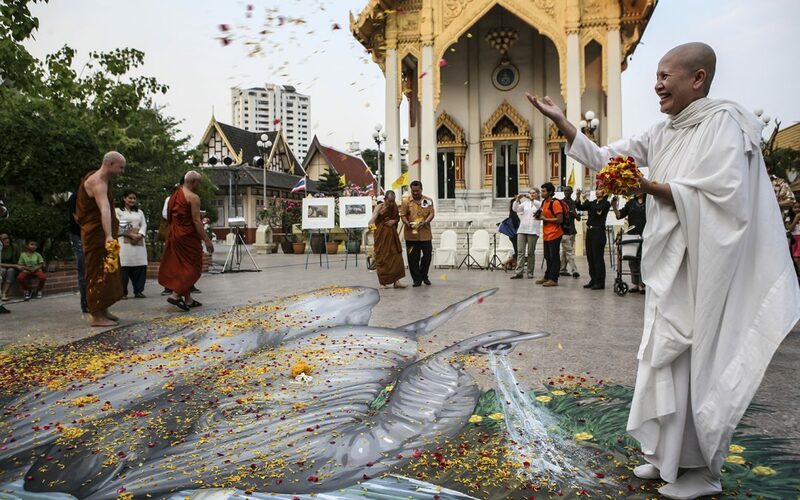 As world governments meet here to discuss global wildlife trade, revered Thai Buddhist leaders today held the first-ever Buddhist merit-making ceremony to pray for the tens of thousands of elephants poached annually. They also called on their congregations and other temples to reject the use and trade of ivory. A large percentage of Thailand?s ivory is bought by foreign tourists, but there is significant demand among devout Buddhists for ivory carved into images of the Buddha, amulets, and other objects of worship. Leading the merit-making ceremony were Ajahn Jayasaro, a forest monk and Buddhist teacher; Phra Maha Jerm Suvaco of the Maha Chula Buddhist University; Mae Chee Sansanee, founder and director of Sathira-Dhammasathan Center; and Phra Paisal Visalo, abbot of Wat Pasukato. Each offered teachings on conservation and the role of Buddhists in saving elephants from wildlife crime. ?We are honored to come together with the Buddhist leadership of Thailand, on this auspicious occasion of making merit for African elephants ? the first ever for elephants,? said Dekila Chungyalpa, director of the Sacred Earth program for WWF. ?Because faith leaders are speaking up about environmental sustainability being consistent with religious values, we are now seeing a new movement of faith-based conservation all over the world.? Supported by WWF, the event at Wat That Thong in downtown Bangkok sought to educate the deeply religious Thai public on the link between ivory and wildlife crime, and encourage the leadership of Buddhist temples and congregations to discontinue the use and trade of ivory. Thailand is the world?s largest unregulated ivory market and a major sink for ivory poached from Africa. In opening the current meeting of the Convention on International Trade in Endangered Species (CITES) here on 3 March, Prime Minister Yingluck Shinawatra announced a shutdown of the country?s ivory market though gave no timeline. The event also featured a giant chalk drawing of an elephant designed by artist Remko van Schaik with messages in English and Thai saying ?I am not a trinket? and ?Ivory belongs to elephants.? Attendees took photos with the elephant artwork and also wrote prayers for poached elephants and hung them from trees in the courtyard of the temple. ?Having prestigious leaders from the Buddhist community in Thailand lead this ceremony here, which is usually practiced for a family member who has passed away, emphasizes that we are all interdependent and part of one great web of life,? said Phansiri Winichagoon, country director of WWF-Thailand. Monks, members of the Thai public, government representatives, and delegates from the ongoing CITES attended the ceremony. The CITES trade talks continue through 13 March. Conservation groups are calling on the 178 countries in attendance to take action by the end of the meeting against countries failing to comply with their international commitments to stop unregulated ivory trade. Tens of thousands of elephants are poached in Africa every year to feed world demand for ivory.